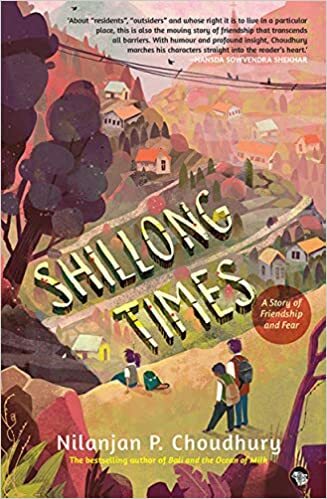 Shillong Times: A Story of Friendship And Fear by Nilanjan P. Choudhury becomes the story of a boy who becomes a man, of a man who becomes mature, of a conscience that draws from childhood memories to bear witness to a journey. In this book you really want to get in, to get on the yellow bike and slowly go through Shillong, a city lying under the light in a slow passage from one awareness to another. Shillong’s problems are part of an extremely complicated and explosive regional context at a time when linguistic tensions are much more damaging than religious tensions. If we look at the community violence, we can see that most of the tension is mainly linguistic. In Shillong Times, Nilanjan Choudhury works to unravel the prominent role played by collective identities and community sentiments with an aversion to community thought as well as the exclusive and collective identities that flow from it. It is because the violence engendered by these community logics has torn apart Shillong, a subject that also permeates this novel. The story of the novel is relatively simple. Debojit Dutta aka Debu is the protagonist of the novel, who subtracts brief moments of truth-makers from the passing of time. His energy, the revolutionary force of the will, and the sense of the evident action, right away resounds in the book. Around him are a microcosm of characters, who are all different, and all wrapped in a veil of nostalgia. In fact, it is evident in the passage, the desire to underline the current loss of the sense of beauty, understood not in its aesthetic sense, but in the deeper one that springs from the relationship of aesthetics and ethics. Debu will face all this helped by Clint, and Audrey Pariat, the prettiest girl in town. The encounter with this reality will move Debu into unknown feelings, bringing to light a new awareness and perhaps the birth of a love. This adventure will completely change the existence of Debu. He will face it by engaging in the fight against a society full of flaws, a society that divides on communal lines. Debu, until then involved only half in life, will face loneliness, fear, value and consistency, pain without which the world would not stand. Above all, the charters must overcome the disturbing and terrible inner fears like little creatures that dwell within us in order to create in turn a world in which there is no longer fear, a new world in which to be safe. Debu and Audrey have to live in a reality that is not their own, a world beyond the mirror on which two moons shine. Divided and hunted, constantly in danger of life, it seems that everything is combined to prevent them from meeting. The loneliness that transpires in almost all the characters of the novel is penetrating, perfectly rooted in the story that they live and that at the same time try to fight. The desire for love seems adolescent and the two moons suspended in the sky seem to embody a desire for love. Walking resigned through an ugly city, not aware of the details, ignoring the landscape means ignoring the very soul of the city, as it means living under anesthesia. With time, however, Debu let it flow more slowly which allows him to find that sense of wonder and belonging to the place and at the same time the love and the desire to fight for the place itself and for the people who live there. The value we give to things, the care we have for them, make the difference in our civil being. On the background of the novel, moreover are the family, the friends, the autobiographical traits and the courage to expose themselves, to reveal to the reader vices and defects of their own. The book has an ironic, contemporary language and a horizontal timeline, where past and present are delicately intertwined. The track merges parallel lives of Debu and Audrey upset by a mocking destiny. It is only towards the last that emerges in all its entirety the force of life, becoming lyric of beauty. The writing flows in a simple and engaging way, with the narration allow the reader a greater harmony with their emotions. The writer sends a message in the bottle that goes straight to the heart for those who want to find out who and what lies behind the chrysalis of air. It is not easy to understand it, but unfortunately, the reality of the religious and fanatical sects that are closed to the contemporary world, is dramatically true. And the reader cannot help but feel dragged, involved, laid bare and finally absolved by his own humanity, just as the protagonists of this magnificent array of affections and lies are absolved before the last line. Nilanjan Choudhury uses conversations and encounters staged in his novel to test the fragmentation of Indian society, and the way in which these fragments and communities have always hindered national unity and the dreams cherished by everyone. All the contradictory interests that animate the region pass there, in the form of nicely brushed portraits. The book leaves a clear impression on the reader and many question marks.